Funny story. Well, maybe. I was brushing my teeth yesterday morning, thinking about the whole Sony/“The Interview” kerfuffle. Now, I have my thoughts about that, and I may share them separately at some point. But as I was brushing my teeth, I remembered another useful improvement the folks at Adobe have made to Illustrator. Often when working with Illustrator, you may find that you’re not only creating art within the program, but you’re also placing in external elements– like images. 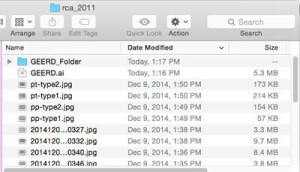 These can be placed either as links, or embedded directly into the file. On one hand, a linked file allows for a leaner Illustrator file. The linked image can be edited externally (think, for example, of color-correcting a photo or putting a clipping path on the image), and the changes would be reflected back in Illustrator once saved. However, send that file out without also sending the linked image, and you’ll run into trouble. An embedded image eliminates the risk of missing links, by sheer virtue of it being part of the Illustrator file. The downside of this is you Illustrator file will likely balloon in size (depending on the size of the link, and if you work with high resolution images, you can bet it will). You will also no longer be able to edit the embedded file. Packaged files (also sometime called collected files) solve the issue of potentially missed links without unnecessarily increasing file sizes. 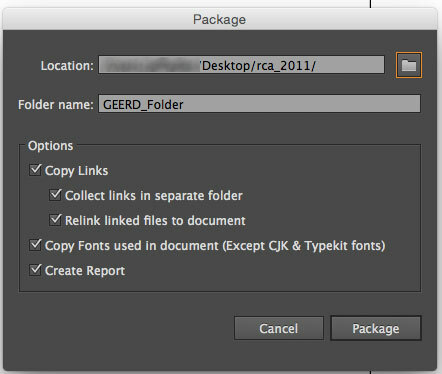 If you’ve ever used Adobe’s InDesign or QuarkXpress (the “Coke and Pepsi” of page layout programs– so to speak), you’ve likely packaged or collected files. Essentially, a packaged file (I’m going to stick with that term, since this is what Adobe uses) is a separate folder that’s created that includes the original file, and can include all links and fonts. It’s a real convenient way to send files to third parties or printers so that they have everything that they would need to open the file with (in theory) no errors or discrepancies. 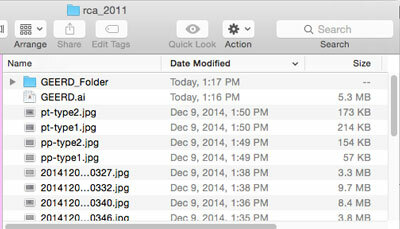 When sending files for others to modify and work off of, I think packaged files are great. When sending out to printers… That’s a different story (personally, I prefer sending press-ready PDFs whenever possible, but that’s a discussion for another day). In programs like InDesign or Quark, this feature has been built in to the software for a long time. Illustrator users were not so lucky, and were left to rely on outside help. In this case, plug-in software. When I first started working on packaging production art (back in 2005), this was the way things were done. I believe the software was called Art Bin. This piece of software collected Illustrator files in a manner similar to Quark or InDesign. Unfortunately, a native feature wasn’t available in Illustrator at the time (I believe it was v.9), and users were left with these third-party solutions. The alternative to packaging files being embedding photography/links and outlining type. This at least ensured all image elements are included and there are no font-related issues. And so it was until not too long ago. I’ve been working primarily on packaging since then (both freelance and in-house). My software of choice is Illustrator, and a lot of times I use photos or other outside images. Up until recently, if I wanted to send files to a printer, I resorted to the embedded file and outlined type method of file output, more out of necessity than choice. Nowadays, it’s 100% a matter of choice and minimizing the impact a printing bureau may have on the content of the art supplied. With the latest version of Illustrator (as of the end of 2014 we’re at CC, their new subscription-based model), Adobe’s bridged the gap between software apps and users now have the ability of packaging the art like they would in InDesign. Let’s look at how it works. For this tutorial (I guess that’s the best description), I created a file and named it GEERD.ai (GEERD™, for those unfamiliar, is something I’ve come to call myself. It’s a combination of “geek” and “nerd”.). 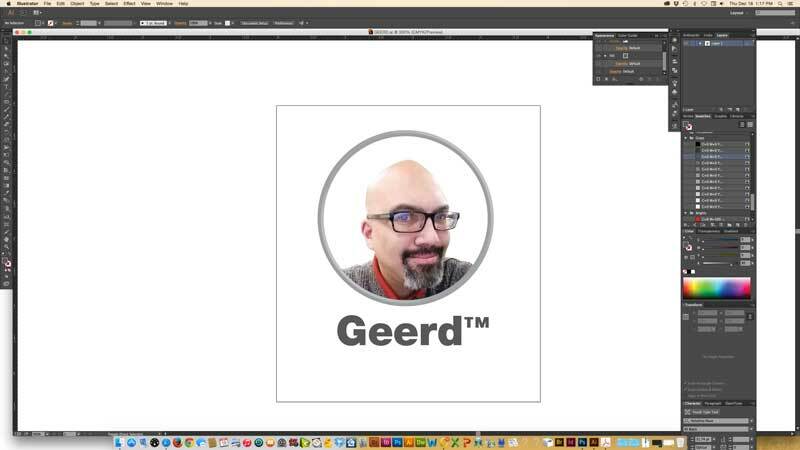 I placed a picture of myself, a circle with beveled edges and some type. 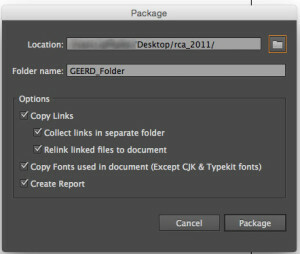 So, if I wanted to package my file, this is the menu option I would select. From here on out, it’s a pretty straightforward process. After selecting “package”, you’re prompted to select where your files will be saved. You can leave the default location (which should place it in the same folder as the original piece of art), or a different place altogether. It will also give you the option to (re-)name the folder, if you so desire. All this is up to you, the user, to decide. The packaging of your files is now complete! The main package folder sitting in the folder it was saved. … and then opening the folder itself. 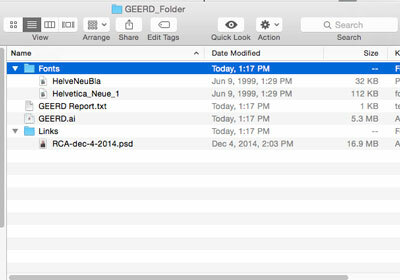 This is everything that’s inside the packaged folder– including a PDF. After that, the folder can be burned on a disk, put on a flash drive, or zipped and either emailed (size permitting) or sent via any number of cloud-based file sharing services (like Dropbox, Google Drive, Copy, Microsoft’s OneDrive, just to name a few). So there it is. A quick, easy way to take files and all their ancillary elements and put them in one folder for ease of transport or distribution. I hope you’ve enjoyed this, and I’l see you here next time. OK, so maybe I won’t really see you. At least not physically. But your comments or input would be greatly appreciated.